Jet Jockey - was born at DCCI 1-18-86 from embryo transfer. He serviced as a yearling and 2 year old at DCCI. From the breeding pasture he was removed the day before, and hauled to the World Show at Fort Worth, June 1988. JJ had won several championships but his worst competition was a bull named Right Hand Man shown by Louann Christ of Kansas. Prior to the World show RHM had a testicular malfunction and Christs had his affected testicle removed. He continued to show with a veterinarian's certificate explaining that he was really genetically okay, but due to an injury he was only half there. Judges mostly accepted this and sometimes he beat JJ -- sometimes not. I showed JJ at the World Show and he was a pain. He was a kind disposition, but slept through every event. His back was a tad low so I lifted his back as much as possible with a stick, which was a major lift. He wanted to sleep so I lifted his head as high as possible. Showing him was an exercise workout. If you relaxed either point he dropped down immediately. A high-up political official walked into the arena and told the judge that a one testicle bull would not be a good thing to allow to be at the top of the Sr. Bull class. After pointing out the serious nature of the problem, the judges caved and placed the beautiful Right Hand Man toward the bottom of the class and Jet Jockey was World All Age Bull Champion. He was the first and one of the only World All Age Grand Champion bulls to be over 60" T2T. His female line is in Circle K Donovan's pedigree, he was an ancestor of Not Gunna, Jester, Juma, Drag Iron, Winchester, Westward Ho, JuJu, Kookadoo, Temptations The Ace, Lacey Jet (world champion female) Clear Win, and Clear Point. Right Hand Man was purchased by George and Peggy Wilhite. 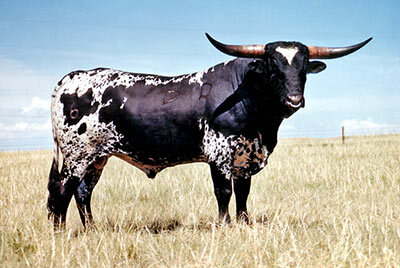 He sired Texas W Rose Bud the grand dam of Rio Grande and great great grand dam of Cowboy Tuff Chex. All the truly great sires have a strong foundation of strong genetics.